* Some room sizes have been changed, e.g. the front bedrooms are longer, to allow for extra hallway cupboards. * The guest bedroom has also been slightly increased in size. * An additional alcove near the laundry for the chest freezer and beer fridge. 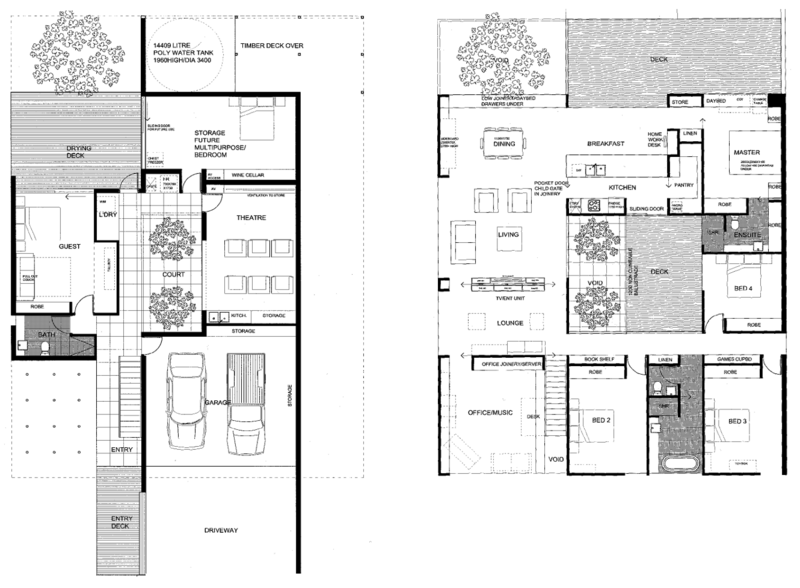 * The pantry/master bedroom doorway area has been rejigged to allow for a small desk in the kitchen. * Adjusting the western wall of the first floor to add some extra built-in space. * Kitchenette in the home theatre. The biggest change is of course the big "extra" room at the back of the ground floor. This came about when we were discussing future expansion capabilities ("just in case") and we thought it would be the best spot, and it was be easier to excavate while building rather than try to do it in the future (which would be pretty much impossible). The trade-off of course is that of cost. Our architect has made it no secret that this is not going to be cheap - at least he is not setting us up for a big shock! We have therefore made the decision to leave the guest bedroom, guest bathroom, home theatre and the spare room downstairs totally unfinished (no plaster, floor, painting or electrical - just the plumbing fittings in the bathroom). Only the hallway and laundry will be completed (and obviously the garage will have very little work required in it). One thing we have noticed is how well bedroom 4 fits our original "multi-purpose" room - its visible from the kitchen, out of the way of the rest of the house, has glass windows/doors between it and the rest of the living area ... but of course we would lose a bedroom. We'd need to: stop at 2 kids, or make two of them share a room, or get the extra room downstairs done... no, I'll stop thinking about that now! I think I'll do a series of "before and after" house posts which include comparisons in areas between our current house and the new house. I think it would be a good opportunity to point out not only the good bits of the new house but the bad bits of the old house!